Cordless, brushless, and loaded with features, Makita’s latest 10″ sliding compound mitre saw (DLS110Z) is now available at KMS Tools—online and instore. This 36 volt (18V x 2) saw makes fast and accurate cuts, just like a corded mitre saw. And thanks to its compact footprint and slide-forward design, it offers the best of convenience and portability. Keep reading to learn more. 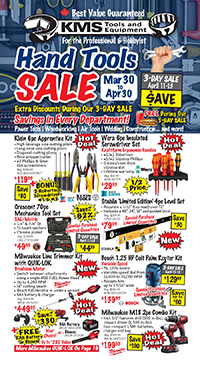 Or visit your nearest KMS location, check out the flyer or browse kmstools.com to find the latest prices on this saw and much, much more. Fueled by two 18 volt LXT lithium ion battery packs, the DLS110Z’s brushless motor delivers powerful cutting performance and impressive runtime—without having to plug into an outlet. 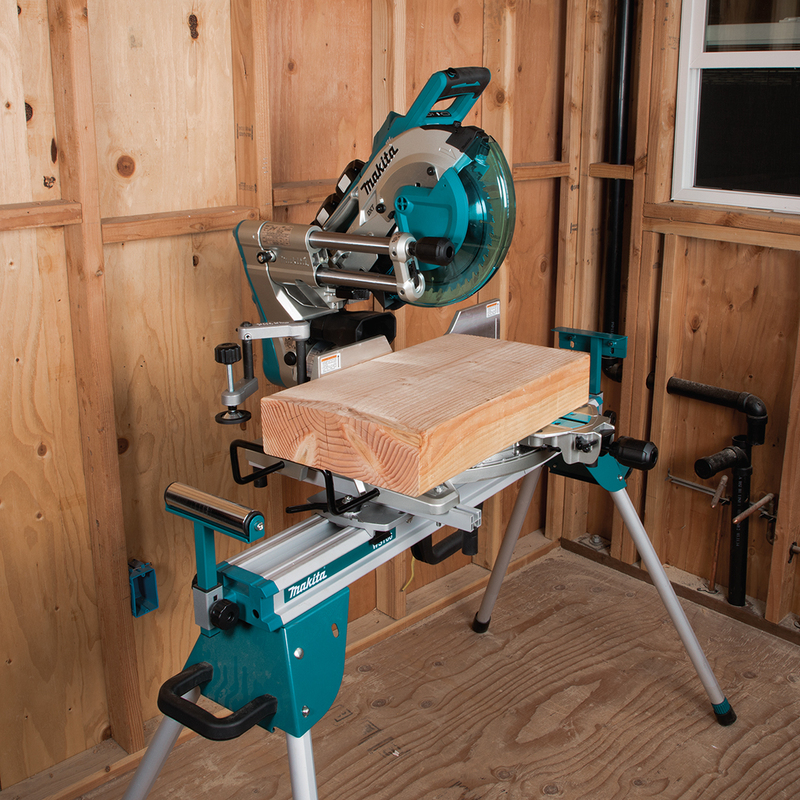 When using two 5.0 amp hour battery packs, the DLS110Z will make up to 350 cuts in 2×4 lumber on one charge. If you’re a professional finishing carpenter and woodworker, this means you could work all day without changing batteries, especially if you’re cutting lighter materials like moulding, trim or baseboards. Makita’s Automatic torque Drive Technology (ADT) adjusts cutting speed and torque output to optimize performance for the application. For example, when cutting trim, casing or other light material, ADT delivers faster RPMs. For heavier applications, like cross-cutting dimensional lumber, ADT automatically switches to a higher torque setting. The saw also features Makita’s Deep and eXact cutting Technology (DXT), which provides additional cutting capacity with a moveable rear blade guard and three-stage gear reduction system. Essentially, the gear drive allows the saw to use more blade, increasing the vertical cutting capacity. 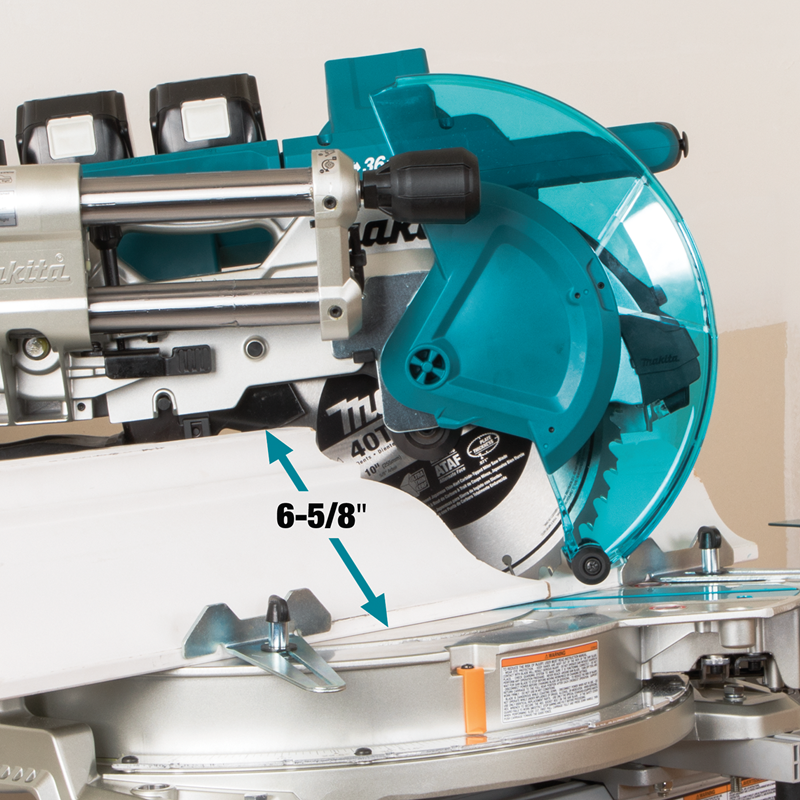 For nested crown moulding, that’s 6-5/8″, tops among 10″ mitre saws. Plus the DLS110Z can handle up to 5-1/4″ of baseboard (vertical) and can crosscut a 4×12 piece of lumber at 90°. The DLS110 comes equipped with upgraded slides—now 30 mm in diameter with linear ball bearings. These new slides add overall stability and improve precision when making bevel cuts. Because the slides face forward, the saw has a smaller footprint. It can operate in confined spaces, even up against a wall. Equipped with a three-stage gear drive and moveable guard, the DLS110Z uses more blade during cuts. Its vertical capacity is 6-5/8″ for nested crown moulding. Shop KMS Tools today to find the latest deals on this saw. MAK-DLS110Z includes cordless 10″ mitre saw, carbide-tipped blade, dust bag, vertical vise, triangle rule, and hex wrench. Batteries and charger sold separately. This entry was posted in Archives, Cordless Tools, New Tools, Power Tools and tagged cordless tools, main_page, Makita, Miter Saws, new tools, Power Tools by Your Friends in the Tool Business. Bookmark the permalink. Next → Next post: Milwaukee M18 FUEL: Available for Pre-Order!